This program will take you back to the days when winter sports flourished throughout the Northeastern United States, like Stowe, North Conway, Woodstock and Lake Placid. It includes scenes of skijoring behind horses, cars and airplanes… ski races up main streets… and all those places where people enjoy winter. 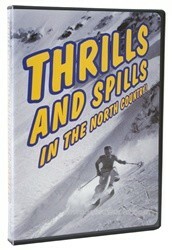 Revisit small neighborhood ski and sledding hills, the downhill skiing boom of the sixties, the lure of cross-country touring in the seventies, the rediscovery of the telemark turn, the birth of snowboarding, and the roots of the extreme skiing movement. The production is built around interviews with over 20 notables, including Brad Washburn, Clarita Heath Bright, Warren Chivers, Bobo Sheen, Brooks Dodge, Tom Corcoran, Mickey Cochran, Sherman and Petie Howe, Donna Weinbrecht, and Jake Burton.